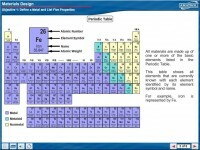 Material strength properties affect the performance and safety of almost every product made. As technology has advanced, material choices have broadened and become more complex. Engineers and technicians alike must be able to select the proper material for an application and analyze material properties when a product fails. 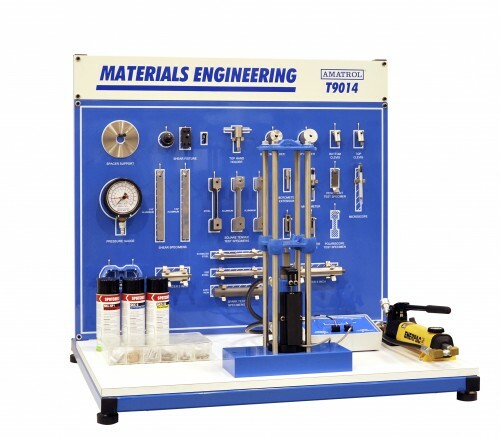 Amatrol’s Materials Engineering 1 Learning System uses industrial quality components to teach students how to evaluate and use different industry grade materials. The 94-MT-1 allows students to conduct a wide array of tests including tensile testing on steel alloys. Students learn industry-relevant skills in materials testing (tensile, compression, hardness, and shear), computerized data acquisition, chemistry of metals, interpretation of industry-standard numeric identification systems of various types of metals (steel, aluminum, brass, and copper), material strength analysis, and product design. Data Acquisition System – Amatrol’s data acquisition system allows students to measure the stress and strain of many different materials through the use of sensors integrated with software. A signal conditioner unit interfaces with real-time data acquisition software using a graphical interface. Student investigation is enhanced through the ability to create custom formulas, configure channels, conduct time and event-driven sampling as well as display graphical results real-time. Wide Array of Industrial Material Testing – Students use the 94-MT-1 to learn about non-destructive as well as destructive testing. Non-destructive topics include measuring, visual inspection, penetrants, magnetic-particles, ultrasonic and radiographic testing with hands-on skills in penetrants. Destructive tests covered include tensile, compression, shear, torsion, fatigue strength, toughness and hardness. Amatrol is unique in providing the ability for students to test a wide variety of industrial materials under conditions they will encounter in industry, including power tensile testing on steel alloys.